Agnes Irwin girls are curious. Articulate. Confident. Engaged. Creative. Powerful. And authentically themselves. Learn more about Student Life @ AIS and the storied traditions and activities that keep our campus abuzz. Ask any current student or alumna about their time at Agnes Irwin, and they will undoubtedly share one or more of the traditions that thread our community together — from 1869 through today. AIS pride is on display during AIS/EA Day, a four-sport competition against Episcopal Academy every fall. Pep rallies, team dances, and carbo-loaded pre-game dinners lead up to this annual event where students, faculty, and alumnae don blue and gold in support of the Owls. Just before winter break, the entire school comes together for the Holiday Assembly, a raucous gathering of singing, silliness, and excitement for the multitude of holiday traditions celebrated by our community — ending with drums, noisemakers, and sometimes a balloon drop by our seniors. Peasants, jesters, knights, queens, friars, and farmers come together in our “castle” to celebrate Medieval Night. This evening is a highlight of sixth grade — students, parents, and faculty are transported back to medieval times through costumes, scenery, dance, music, and a feast fit for the times! A rite of passage: Each senior prepares and presents a 10-minute speech on the topic of her choice — sharing her passion and knowledge with the entire Upper School. For over 75 years, Agnes Irwin lower school girls have danced around the maypole and sipped on lemon sticks in our annual celebration. Our lawn is transformed into an old-fashioned carnival, full of food, games, and fun for our community. At year's end, upper schoolers announce new leadership for the next year’s clubs, and literally climb over the seats in the West-Wike Theatre to assume their new position in the auditorium as they advance grades. The seniors “exit stage left” and everyone heads outside to watch the Senior Drive Around. Make a wish! On this day, sophomores receive their class rings, emblazoned with the laurel and lamp of our school seal. After making wishes and turning the rings, the class enjoys a day of fun, games, food, and camaraderie. Learn. Play. Explore. Grow. 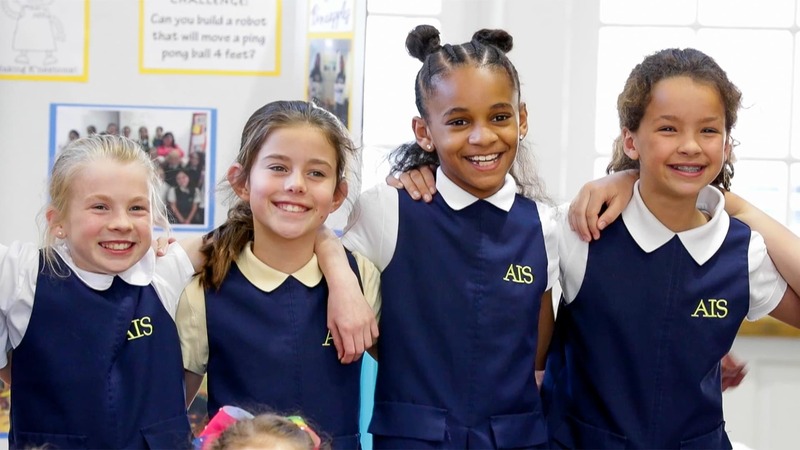 Lower School @ AIS is all about following curiosity and understanding that young girls can do anything. Stand up. Speak out. Own your voice. Middle School @ AIS connects students to each other, the world, and themselves, and empowers them to reach higher. Dive deep. Think differently. Lead the way. Upper School @ AIS embraces the personal journey and discovery which sets the trajectory for higher learning and future success. "Being an Agnes Irwin girl means never giving up. Do what you want to do, not what your friends are doing. It means being your own leader, and setting your own goals." "I like Agnes Irwin because the founder of the school was independent minded —just like me." "At AIS, I have the opportunity to explore so many different paths that I may choose to take for the rest of my life. I am able to find the path that is perfect for me." "AIS offers a lot of opportunities for every aspect of your life, regardless of what you are interested in. Not only are there a multitude of classes and clubs, we also have community service activities, travel opportunities, summer activities, and art classes —so you get to try a little bit of everything." "The most meaningful opportunity for me at AIS is the chance to travel abroad. I went to China on an exchange program and it was truly life changing — the experience opened my eyes to a completely different way of life and I met so many amazing people. Without AIS and the faculty and staff here, this trip would not have been possible and for that, I am so grateful." Want to purchase AIS merchandise?